Thursdays at the Farm from 12:00-6:00pm. Sundays at the Farm from 12:00-4:00pm during our Farmers’ Market. Our harvest season is approximately 30 weeks from November through May. Each week’s share will be a little different in variety and quantity, depending on what’s growing and how much is harvested from the fields each week. We aim to have 8-12 different items in each share including salad greens, cooking greens, root crops, herbs, flowers, and vegetables. Take a look at our chalkboard to see what’s being harvested for our Members this week. Or check out our Vegetable Directory for samples of what we grow and what you can do with them. We have several locations for you to choose from to be your pick-up point. At the Farm we have pick-ups on Thursdays from 12:00-6:00pm or Sundays from 12:00-4:00pm during our Farmers’ Market. *Outside of the farm we offer pick-ups Mondays from 3:30-5:30pm at USF Botanical Gardens (12210 USF Pine Dr, Tampa), Thursdays from 4:00-7:00pm at Buddy Brew Coffee in South Tampa (2020 W. Kennedy Blvd. ), or Fridays in St. Petersburg from 4:00-6:30pm at Green Bench Brewing Co. (1133 Baum Avenue North). For these offsite pick-ups there is a minimal fee to help us cover the cost of transportation and staffing for these pick-ups. The one time offsite fee is $30 for a Half Membership and $60 for a Full Membership. On your membership application you will be asked to choose a pick-up day/location. We will set our harvest schedule each week based on this information, so it is very important that you pick up only on your scheduled day and only at your scheduled location. If you are unable to make it on your day and are not able to send someone in your place, you should Contact Us to see if another arrangement is possible. Sweetwater’s Membership prices cover the costs involved in growing you the best possible product. Donations above the minimum in each category are deeply appreciated as they are used to fund our farm outreach and educational programs. 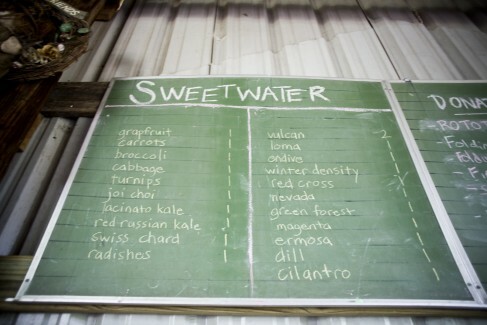 Support above the minimum level recognizes the importance of promoting Sweetwater’s mission and helps to expand and support the farm’s growth, outreach, and educational efforts. Receives one share of farm produce every other week. Invited to attend all farm functions. Contributes at least 4 volunteer hours per season to farm activities. Receives one share of farm produce every week. Free admission to all Events, Workshops and Learning Opportunities at the farm. Receives a Sweetwater 100% organic cotton T-shirt. Name (or Business) is listed under “Friends of the Farm” on our website for one season (optional). Payment plans are available for the 18-19 season. They will only be available for the on-line application and payment process for a limited time. Our payment plan is designed with a simple down pay and then equal payments due on the 15th of each month in order to pay off the balance prior to the start of the season. The amount of payments will be determined by how many months are left between your down payment and the start of the season. For example, signing up and paying the down payment in June, means you will have 4 additional equal payments; one in July, August, September and October, but signing up and paying your down payment in July, means you will have 3 additional equal payments; one in August, September and October. We do not charge your credit card or bank account automatically, as we do not collect that information. You will receive a pay pal invoice each month as both a reminder and for payment convenience. 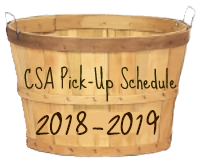 All payments are non-refundable and payments must be up to date to pick-up CSA shares. Late fees do apply, see your invoice for details. From October through May, popular volunteer work times are Thursdays, Saturdays and Sundays, especially in the mornings when we’re harvesting. Volunteer Opportunities are highlighted on our website and in our monthly newsletter (sign up below!) or contact us to see how our needs and your talents might align. We hear ya… times are tough and working families often can’t afford the extra time to devote to the community. If you are unable to meet your 4-hour volunteer commitment, you may “opt out” of your volunteer hours by paying a $30 fee anytime during the season. Just click the link below and enter your email address in the space specified. You’ll receive an email with a link to log in to your membership, where you can update the volunteer info. Already a Member, need to make changes?